Fair Food Farmstand and PAWS are environmental and animal friendly ways to get involved. COLIN KERRIGAN TTN The Fair Food Farmstand at the Reading Terminal Market and the Philadelphia Animal Welfare Society (PAWS) in Northern Liberties are nonprofit companies that are always looking for passionate and dedicated volunteers. If your New Year’s resolutions include reducing your carbon foot print, helping animals in need or lending a hand to a local Philadelphia neighborhood, there are plenty of opportunities for you throughout the city. With organizations like the Fair Food Farmstand and the Philadelphia Animal Welfare Society (PAWS), your 2010 resolutions will be easier and more fulfilling than last year’s promise to make it to the gym four days a week. PAWS is a nonprofit organization dedicated to saving homeless, abandoned and unwanted animals in Philadelphia. The organization represents the city’s only no-kill center, and its mission is to make sure every healthy pet finds a loving home. Donations to PAWS help fund its large number of animal-saving programs, including low-cost vaccinations, adoption programs and spay and neuter surgeries. With an increased “save rate” of about 50 percent from 2005 to 2008, PAWS’ benefactors and volunteers seem to be meeting their goals. But PAWS is always looking for volunteers. Homer went on to describe an almost-never-ending list of volunteer work for people of all abilities and backgrounds. “And if someone has limited mobility, they can do paperwork. We have something for everyone,” she said. Interested participants, who must be at least 18, can visit PAWS’ Web site at phillypaws.org, where they can fill out a volunteer form. If food is more your thing than fur, the Fair Food Farmstand could be the volunteer opportunity you have been looking for. 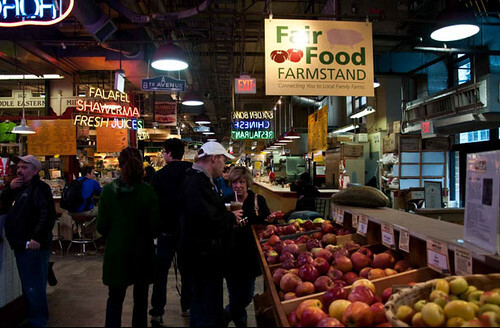 Located in the food Mecca that is Reading Terminal Market, the stand, started by the White Dog Café Foundation, carries fresh vegetables and fruit, dairy products, meats and poultry from more than 90 organic and sustainable food producers and farms in the southeastern Pennsylvania region. Since expanding its location in the market in October 2009, it’s become a go-to stand for large apples, stacks of layered leafy greens, locally made tofu, a variety of breads and flours and other foods so fresh you’d swear they were just pulled from the earth. Plus, the expansion has opened up more opportunities for those who want to share their love for eating locally. Ariela Rose can be reached at ariela.rose@temple.edu. With the variety of not-so-healthy foods on Main Campus, healthier green options are valuable. Last week’s GreenFest Philly marked the beginning of a season of eco-focused events placed not only around Philly but on Main Campus as well.